The way this piece has been treated is what really makes it stand out from everything else. While many pieces containing crosses are purposefully made so that they're smooth and pleasing to the touch, this one had been hammered so that it has quite a lot of texture to it. Not only does it provide texture, but it gives it that certain visual appeal that only something as unique as this piece can have. Combining with that interesting texture is the fact that this piece is highly polished, to the point where it gleams. A great gift for anyone who's looking for something a little different to add to their collection. 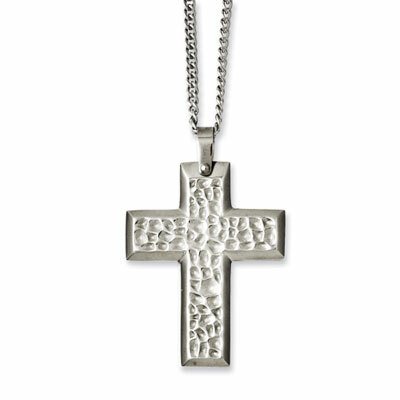 This stainless steel cross has a great hammered texture and is high polished. Cross measures 36mm (1 7/16") x 27mm (1 1/16") and comes with a 20 inch 2mm curb chain. We guarantee our Hammered Stainless Steel Cross Necklace to be high quality, authentic jewelry, as described above.